There are also multi-purpose fire extinguishers - such as those labeled "B-C" or "A-B-C" that can be used on two or more of the above type fires. For home a Class 2A- 10 BC fire extinguisher is recommended. The size of this extinguisher makes it very easy to use. 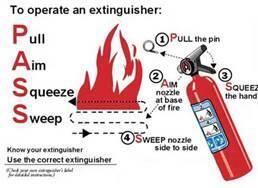 The acronym P-A-S-S is used to describe the four-step process in operating a fire extinguisher. Pull: Pull the safety pin on the extinguisher. Aim: Aim the hose of the extinguisher at the base of the fire. Squeeze: Squeeze the handle to discharge the material. Sweep: Sweep the hose across the base of the fire from side to side. If you are in business or planning on opening a business in La Grange, please refer to the Business Requirement letter from the Fire Prevention Bureau. Sound Decision Making, Training, and Maintenance are all required to safely control a fire with an extinguisher. Should you need to discard an old fire extinguisher never throw away a pressurized extinguisher in the trash. Contact aFire Extinguisher Company for details.